Dog Jaunt is for people who want to take their dog along with them, on trips of any length. Sometimes, of course, you absolutely can’t bring your dog with you: your workplace forbids dogs, or you’re visiting a country with grim quarantine laws, or you happen to know that the Met searches visitors’ bags and all will be revealed once the zipper of your tote opens. I write about those other times, when you can bring your dog with you but you hesitate because of the trouble it will entail. You love your dog! She hates being left behind! You hate leaving her! Now you don’t have to, because I’ll tell you about great dog-friendly places I’ve found (and how to find more yourself), and I’ll share with you what I’ve learned about getting there and back safely and comfortably (even if “there” is just around town on an errand run). Please note that this blog is directed primarily at owners of small dogs, meaning a dog small enough to fit in a carrier under the airplane seat in front of you. Our dog is that size, and that’s what I know most about. Some of the posts, though, will be useful and relevant to bigger dogs. Please also note that I nearly always refer to a dog as “she” or “her.” I don’t mean to offend or exclude your male dog — it’s just that I have a female dog, so for me all dogs are female until proven otherwise. My name is Mary-Alice Pomputius and I live with my husband, four cats, two chickens and a dog in Seattle. 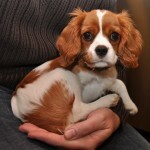 Our dog, Chloe, is a young Cavalier King Charles Spaniel, and we love her dearly. We added a dog to the menagerie because we also love our cats dearly, but they decline to travel with us. We travel often, in the U.S. and abroad, and on nearly every trip we found ourselves wishing that our feet-up time included a snoozing pet. I also spend a lot of time driving, and liked the idea of having a dog along for the ride. We chose a Cavalier because they are the right size (we wanted a dog small enough to fit in a carrier under an airline seat or in an over-the-shoulder tote) and the right temperament for us. On the other hand, I wasn’t completely nuts. We do indeed take Chloe with us on our big trips and she often snoozes, and she does keep me company in the car. We were speedier and more efficient travelers before we added her to the mix, true, but the benefits of having her along far outweigh the difficulties. And with a bit of planning and clever shopping, a lot of those difficulties can be smoothed over. I’ll try to take as many pictures as possible that show Chloe in a particular carrier or crate, so you can use her as a reference point. She’s a Cavalier King Charles Spaniel, and she weighs about 13 lbs. She’s about 12″ tall at the shoulders and about 16″ long from shoulders to rump. She’s about the size of a typical Jack Russell Terrier, a Pug, or a largish Boston Terrier. She’s a pretty big small dog, in fact — any larger, and she’d be a medium-sized dog, along with Shelties and Cocker Spaniels, for example. A reader recently asked how tall I am, so she could properly assess my pictures of airplane under-seat spaces (and the info would be useful, too, for people looking at pictures I’ve posted of pet carriers carried over my shoulder). I’m 5’11” — never quite made it to 6′ tall. My husband, who appears in some pictures, is 6’4″. I want readers to value my opinion, so I am careful to recommend only products that I think are useful for people traveling with dogs. I will tell you when a product has been sent to me for use or review by its manufacturer. Otherwise, I’ve either bought the product or found it in a store or catalogue and think it’s interesting. If you represent a company with a relevant product that you think is a good fit for Dog Jaunt, email me at [email protected] to have it considered for review. Accepting a product does not guarantee a review and coverage may or may not be positive. Reviews of any received products will disclose the source of the item, and products valued at over US$50 will be (a) returned to the manufacturer, (b) given away to readers, or (c) donated. I earn a small commission whenever a visitor purchases an item at Amazon using one of my links. Chloe and I are everywhere you turn on the Internet (one exception is Pinterest — I’ve watched my friends disappear into the Pinterest vortex, and I know it would happen to me too, so I’ve never opened an account). Please join us on Dog Jaunt’s Facebook page, a thriving community of dog travelers exchanging support and tips and good cheer (or, if you prefer, join us on Dog Jaunt’s Google+ page); and please follow @dogjaunt on Twitter, where you’ll find even more tips and companionship. We’re also @dogjaunt on Instagram, where you’ll find lots of pictures of Chloe, among other things. I think we can all agree that pictures of our beloved pets make the world a better place. If you have travel tips, photos, recommendations, or a personal travel story that you would like to contribute to Dog Jaunt, please send me email at [email protected]. Readers’ reports are an important and valued part of the blog’s content, as you’ll see if you scroll back through past posts. I typically confirm that information you send me can be published, but I have been known to forget to. Please help me do the right thing by letting me know if what you send is for my eyes only. Please note that I choose not to participate in link exchanges, nor am I interested in any proposal involving link placement. Guest posts are by invitation only.